The Breede River ( Wide River) is one of the largest navigable rivers in South Africa. Its source is in the mountains near Wolseley and it then flows south /south east through the Breede river valley past Worcester, Robertson, Swellendam and eventually enters the sea in San Sebastian Bay near Witsands. If you are driving east through theBreede River valley from Worcester you cross the river on about three occasions. The first bridge across the river is about a 100 metres wide and is found near Worcester. The river is not very wide here but when it comes down in flood spreads out and the wide bridge is required. At Robertson they have built a caravan park on the banks of the river and have called it Silversands Caravan Park. It is very popular in summer and has an Olympic size pool which is well used. Robertson has temperatures in excess of 40 degrees celsius in mid summer. Leaving Robertson the river flows towards Swellendam where the road crosses it once again. Here the bridge is about 50 metres wide and about 20 metres high. The river flows through a small valley at this point. From Swellendam , it flows through the Bontebok National Park outside Swellendam and makes its way past Malagas to the sea. The river is navigable for about 28 kilometres inland from the sea. It's a tidal river and the salt water penetrates 20 kilometres up river at high tide. (It's not a match for rivers such as the Mississippi) Being open to the sea means that salt water fish such as the Spotted Grunter and the Cob enter the river to breed. The Cob are sometimes caught 25 kilometres up river. During the summer months fishing on the river is normally good and one just about needs a traffic cop to regulate the boats which launch to go fishing. There are many fishermen's tales about the big one that got away but many large Cob and Grunter are caught. I was standing on a jetty near the mouth of the river fishing when a local came along and cast into the river. After a couple of minutes he pulled in a Grunter weighing about two kilograms. It looked big to me, but when a boat that had been fishing up river arrived with a Grunter of about 10 kilograms I told the local to throw his back as it was still a baby. Of course, the excellent fisherman that I am, I never caught a thing. Not even a bite. 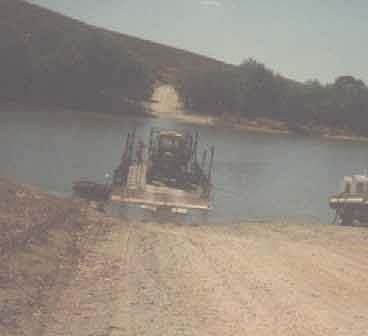 Between the N2 highway and the sea there is no bridge across the river but at Malagas there is a hand drawn pontoon which is pulled across the river by a couple of men. The pontoon which was built in 1960 takes two cars at a time and it takes about 10 minutes for the men to walk the pontoon across the river. This they do by wrapping a short length of chain around a cable which has been spanned across the river . They then walk the length of the pontoon pulling it across the river in the process. The approach roads to the pontoon are bad although on the eastern side there is a good tar road to Witsands. On the western side the gravel road to Cape Infanta is terrible and you are lucky if you don't have to replace a tyre after travelling along it. The funny thing is that Witsands and Cape Infanta are about 500 metres apart on either side of the river and if you don't have a boat you have to travel approximately a 100 kilometres to get to the other side. The beach near the mouth is lovely white sand and there are a couple of sand dunes as well. There are large prawn beds in the estuary of the river. Fishing along this coastline is good in the summer months. At Witsands there are a number of caravan parks which are also popular in summer. We camped in a caravan there one year and a storm came up from the north. I had to hang onto the caravan tent for about two hours to keep it from blowing away, Every gust lifted it into the air and I thought that we were going to lose it and the caravan as well. From June to November the San Sebastian bay is the home of the Southern Right whale. Large concentrations of them occur and one just has to stand at the parking area near the beach to see them blowing and breaching at sea. Its a fantastic sight and people come from all over the world to see them. To reach Witsands one has to drive about 40 kilometres down a road from the N2 highway which has farmlands on either side of it. Its sheep farming country so one is likely to see the odd sheep and a couple of ostriches guarding them. There are many wild birds such as eagles and hawks in the area. If you are near the river you often hear the fish eagles calling in the air above you. As Witsands is a bit off the beaten track a special effort has to be made to get there. When you visit our country make the effort. Its worth it.